“Pierre L'Enfant plans the Federal City,” Histories of the National Mall, accessed April 22, 2019, http://mallhistory.org/items/show/168. 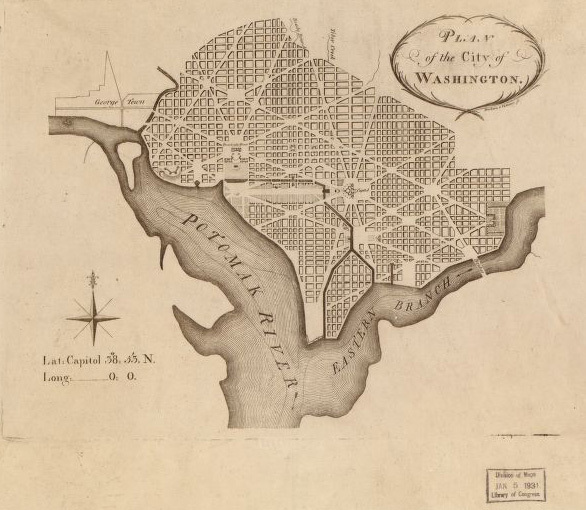 In 1791, President George Washington hired Pierre Charles L'Enfant to create a plan for the layout of the federal city. L'Enfant focused on the area between Tiber Creek, today Constitution Avenue and the Eastern Branch, also called the Anacostia River. L'Enfant surveyed the area in the spring of 1791 and created a plan for the city by the end of the year. This plan established the placement of the Capitol and President's House, now called the White House, and recommended the creation of the public promenade from the Capitol to the Potomac, the area we now call the National Mall. Library of Congress Geography and Map Division. View original.